On April Fool’s Day this year, tourists may have been slightly bemused to have seen processions of men and women in unusual attire descending on St. Paul’s Cathedral, denying them entry for the morning. But this was no foolish event – it was the magnificent spectacle that was the United Guilds Service. St. Paul’s was packed with court members from all the livery companies, all sitting in order of precedence in the main aisle as custom dictates, resplendent in their regalia. 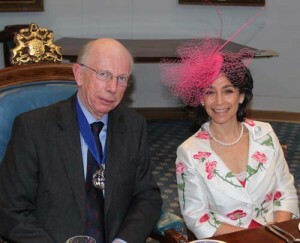 The main procession was a riot of colour and pageantry, and included masters from the Great Twelve and several other livery companies, Sheriffs and Aldermen, the Lord Mayor, many other civic and religious dignitaries, and two distinguished guests – HRH The Princess Royal (currently Master Butcher) and her husband, Vice Admiral Tim Lawrence (currently Master Coachmaker). The Dean of Westminster in his sermon told of the historic ‘rivalry’ between the Cities of Westminster and London. He mentioned that compared to the annual football match between the choristers of Westminster Abbey and St Paul’s, the Abbey’s local derby against Westminster Cathedral was considered a friendly! 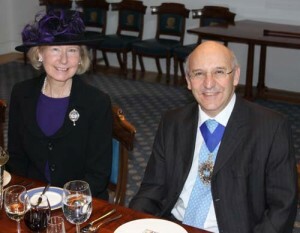 After a rousing rendition of the National Anthem, the Feltmakers party retired to Haberdashers’ Hall, where the Master and his wife, Rosemary, were delighted to welcome the Lord Mayor, Alderman Michael Bear, and the Lady Mayoress, as our special guests, together with Billy King-Harman, the City Marshal. After drinks in the Master Haberdasher’s Drawing Room, a wonderful meal was enjoyed by all present. 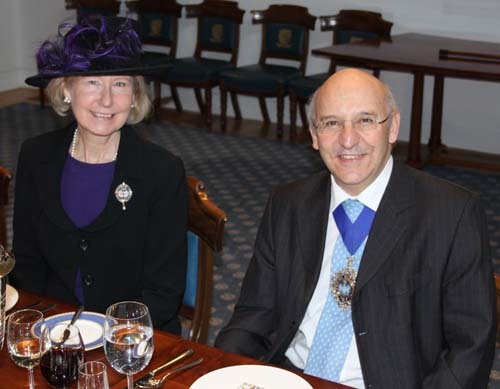 Following lunch, the Master presented the Lord Mayor with a copy of our history, something normally done at the Feltmakers’ Banquet at Mansion House. However, Alderman Bear apologised for not being able to join us in June, but his duties as Lord Mayor were to take him abroad then. Indeed, having just returned from a trip to Vietnam and Malaysia promoting London and its many business interests, he was shortly to depart for an African tour, visiting South Africa, Kenya, Angola and Nigeria. The Lord Mayor then presented Master John Ray with a Porter’s Badge for Old Spitalfields Market, something that the Master later said he wouldn’t perhaps make full use of until his ankle had fully healed! Clearly a busy man – this was his 353rd speech of his year to date – Alderman Bear mentioned that when he met his wife, he had promised her many things, but didn’t include that she may have to live in a ‘council house in Wallbrook’ for a year! He also talked about his ‘Bear Necessities – Building Better Lives’ charity appeal, which is aimed at helping children in London access education and have greater life opportunities, and at supporting international disaster relief. This appears to be proving highly successful, with a rock concert at the Guildhall recently raising over £460,000 in one evening. All in all, this was a very special occasion, and one that all who attended will, I’m sure, remember for a long time.